It doesn’t help to be obsessed with the cold, even after you’ve spent over 13 years in a hot, humid environment (i.e., Houston) and move to a place like Utah that has definite seasons. 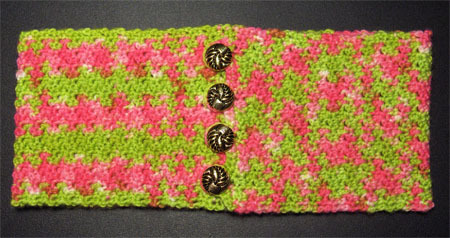 Not only have I become determined to keep my hands warm with wrist warmers, but also with keeping my neck just as warm. After knitting some socks with Andey’s Sock Yarn, I had a skein and a half left over and decided to make myself a neck warmer, which can also be extended to scarf length. I still have a lot of yarn left and can see those wrist warmers taking shape. One of the cool things about using this yarn with crochet is the different patterns you get depending on the stitches and hooks used. 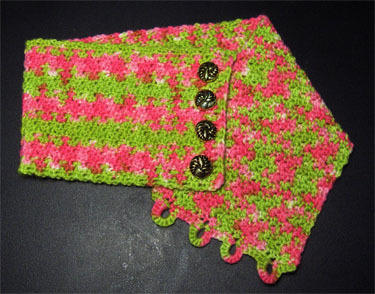 This neck warmer started with stripes and ended up with a checkered pattern! Hook(s): US F/5 (3.75 mm) or size needed to obtain gauge. Widening Instructions are for a width of 4″. To widen the piece, add additional ch in sets of two until it is as wide as you need it to be, then add 2 ch for the first hdc. Adjust the spacing of the loops at the end as needed to accommodate the larger width. Continue to next section for neck warmer or sk down to the scarf section as needed. Row 3 Ch 1, turn, sc in first dc, dc in next sc, *sc in next dc, dc in next sc,* rep from * to * across, ending with a dc in last sc. Row 4+ Rep row 3 until the piece is 20″ long or until piece overlaps from 1/2″ to 1″ and is comfortable when wrapped around neck. Next row Ch 1, turn, sc in first dc and in next 3 sts, ch 6, sl st in same st as last sc to create a loop, sc in next 6 sts, ch 6, sl st in same st as last sc, sc in next 5 sts, ch 6, sl st in same st as last sc, sc in next 6 sts, ch 6, sl st in same st as last sc , sc in last 3 sts. Last row Ch 1, turn, sc in first 3 sc, 12 sc in ch 6 loop, sc in next 5 sc, 12 sc in ch 6 lp, sc in next 4 sc, 12 sc in ch 6 lp, sc in next 5 sc, 12 sc in ch 6 lp, sc in last 3 sc. Fasten off. Weave in ends. Fold the loop end of the warmer over the opposite edge and mark where buttons should go based on the location of the loops. Attach buttons. Wash and block as needed. Row 4+ Rep row 3 until the piece is 50″ long or as long as you need it to be. Ch 2, turn. Last row Ch 2, turn, sk first sc, hdc in second sc and in each sc across. Fasten off.